Wawa workers build a giant hoagie at the 2015 Hoagie Day. Now this is a supersized sandwich. 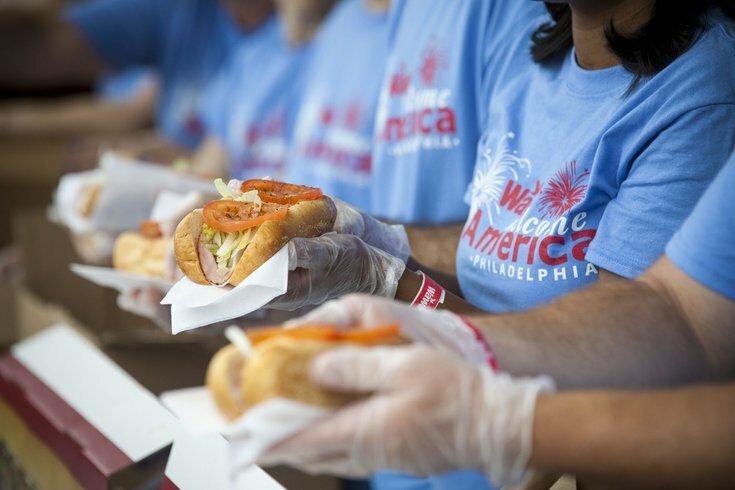 On Thursday, June 30, as part of Wawa's 24th annual Hoagie Day and the Wawa Welcome America festival, 150 Wawa associates and Food Network chef Robert Irvine will combine their sandwich-art talents to create a six-ton hoagie — Wawa's largest ever. The five-hour build will take place on the lawn of the Independence Visitor's Center between 5 a.m. and 10 a.m., piecing together 23,000 shorti hoagies layered with 1,804 combined pounds of ham and salami, 2,504 combined pounds of cheese, 2,705 pounds of shorti rolls and nearly 6,000 more pounds of produce, wrapping and salt and pepper. The hoagie will then be wrestled onto a refrigerated truck and served — for free — to attendees of the Wawa Hoagie Day event later that afternoon. Separately, Chef Irvine and co. will construct thousands of "Hero Hoagies" (a honey smoked turkey hoagie with creamy chipotle sauce) to be donated to the Veteran's Alliance and Philabundance. The Hero Hoagie is also sold in stores, with part of the proceeds benefitting veterans nonprofit USO. Hoagie Day festivities kick off at 11:30 a.m. at the Independence Visitor's Center, featuring a performance by the USO Show Troupe, consisting of Broadway performers. After the national anthem and a brief "hoagie march" of veterans with a hoagie salute, Chef Irvine will tell the stories of local veterans and hometown heroes. The event finishes with a hoagie-building competition between Philadelphia police officers and firefighters that benefit a charity of their choosing. The Pennsylvania National Armed Guard and Pennsylvania National Air Guard will, afterward, compete in a similar hoagie throwdown, in support of the USO. Wawa will contribute $3,000 to all charities selected.